Here's what I have. That's the only SCV I killed that was building something. Did the refinery ever get completed/destroyed? If not then that's the source of the problem and unfortunately I don't think it is possible to fix. nope, that's what I mentioned in an earlier post. it never got destroyed. 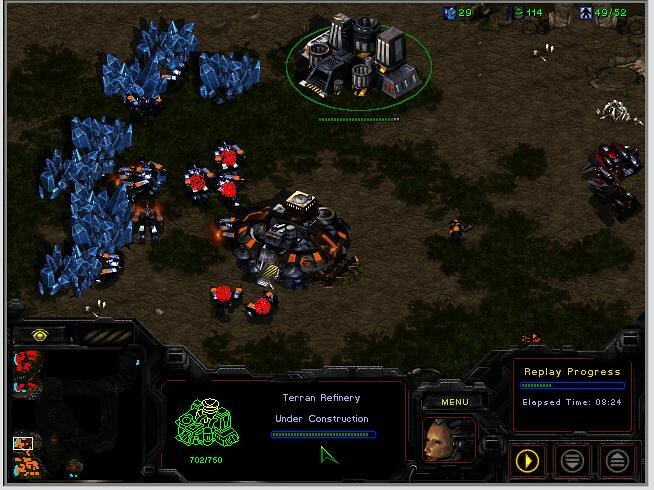 I think the issue with unfinished Terran buildings has been solved in the Entropy mode of BWAI Launcher v1.3. Just for an example I've added a simple replay of me doing a zealot rush on the default Blizzard Terran AI. The replay was recorded in the BWAIWar mode in the Launcher - if viewed in the same mode, the AI staggers after a certain SCV kill, however the same replay viewed in Entropy mode gives different results. by the way when I played the TvT game it was from the AIvsAI package, maybe that's why you don't have that problem. Makes sense. That explains why when I watched Taranok's replay in Entropy mode it didn't line up. I suppose the AIvsAI package should also include the patch to the scv control. There's pretty much no reason to run any exe besides Entropy 3, aside from the cheating AI exe which also has that fix.